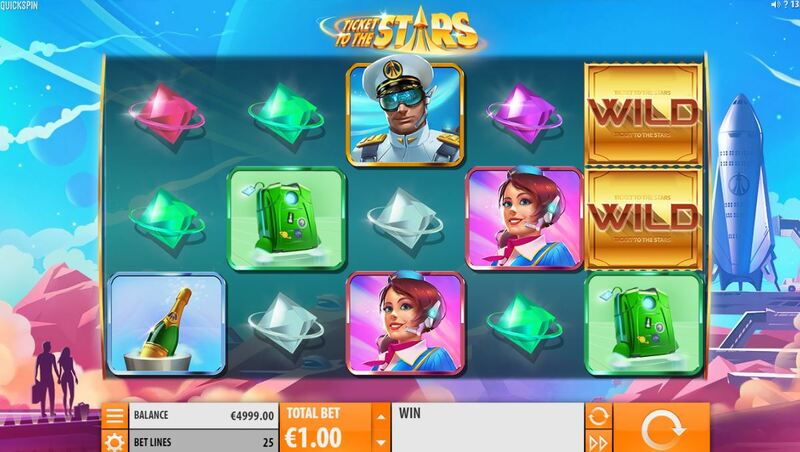 Ticket To The Stars slot is not I'm afraid up to the usual high standard of latter day Quickspin releases such as Divine Dreams and Ivan and The Immortal King. Here the graphics and sounds take a bit of a nosedive and we get a childish cartoon-based sort of Thunderbird's theme in the background with a robot that looks like it came from the 1970's For-Mash-Get-Smash TV commercial and some gentle futuristic music too. We can forgive this nonsense though if there is a good game hiding here, one which may will give our bankroll a big lift-off. 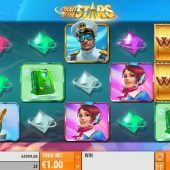 The symbols on our 25-line Ticket To The Stars slot are single with the exception of the stacked Wilds on all reels which pay 20x our 25-coin bet for 5-of-a-kind. This means we could see 500x for an unlikely full screen. The Captain of our silly spaceship also pays 20x, the Female Controller 16x, Ridiculous Robot 12x, Champagne On Ice (yeah, I wondered why too!) 8x and the Kitbag 6x. No card values here but instead we have red, purple, green, blue and white Crystals paying either 4 or 3x for a full line. There's a bit of Bonanza going on here because any winning icons are removed from the grid after the reels have spun and replacement tiles drop down from the top so you can win more than once on any spin. 3, 4 or 5 scatters in view allows you 15,20 or 25 free games respectively. Now during these, when you've accumulated 3 winning actions you get an extra 2 spins rewarded as there are no retriggers. Those 3 winning actions also increase your multiplier by 1x with no limit. The trouble is that your win frequency you enjoyed in the base game seems to diminish significantly in this bonus, often to disappoint with the final result of sub-10x all too often.